Our temperatures plunged this weekend from the 80s to the 50s, suddenly ushering in Fall. After three years of kid-crafting, I have to admit I'm a little tired of pumpkins and apples. So we're celebrating the season with owls! Okay, so I have no clue what owls have to do with fall, but they seem Halloween-ish, so we're going with it. 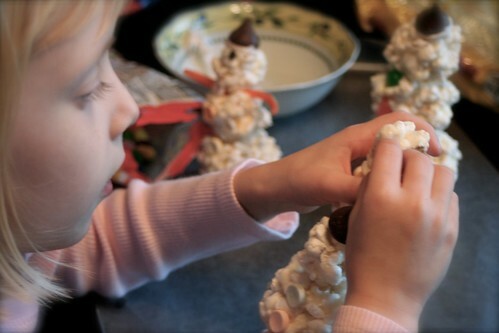 I found this cute craft idea on Frugal Family Fun, showed E and then let her loose. I cut out the wings for her from scrap fabric, but she did the rest on her own. Aren't they fun? I think they'd make great placeholders for an owl-themed board game. I've got dibs on the red! If we're going to talk about owl books, we've got to start with Owl Babies. Beautiful illustrations help tell the story of three little owls who awake to find their mama missing. Owl babies are born at different times and these three feathery siblings are infused with distinct personalities. The story is simple and geared toward very young children, but the illustrations are lovely and worth a look at any age. Those owls are adorable! My daughter's school mascot is an owl, and she will definitely love this craft! These are so cute! I love that you made a group of them. Apples, pumpkins, leaves, scarecrows, bats, owls, pilgrims, turkeys...how else would we know it was fall? Super cute...and we love the book Owl Babies!